Aside from chemical modification, increasing the surface area of a photocatalyst material is a very important strategy to improve its photocatalytic activity. Although nanoparticles possess large surface area, problems arise from the aggregation of nanoparticles in solutions and difficulties related to the recycling of nanoparticles limit their practical applications. However, introduction of porosity into a photocatalyst structure not only provides a large surface area for adsorption of organic molecules and their subsequent photodegradation, but also improves the light harvesting by increasing the optical path length of the incident light inside the porous structure. The porous structure of a photocatalyst also provides a medium for better diffusion of reactants and products and can add selectivity to the properties of the photocatalyst material. Moreover, nanoporous photocatalyst materials can be easily recycled and reused which is very important in practical applications. 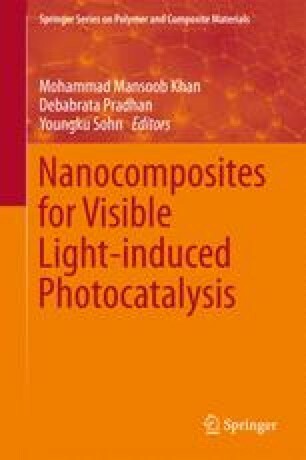 In this chapter, the most common methods for the preparation of nanoporous nanocomposites for photocatalytic applications are presented. The parameters controlling the morphological characteristics of nanoporous structures together with the photocatalytic activity of these structures are discussed.